In 2019, Embelton Hall Dairies are delighted to be working with Middlesbrough Council, Durham County Council, Hartlepool Council and South Tyneside Council to provide schoolchildren across the region with a deeper insight into dairy production and where food comes from. We are encouraging all pupils in Year 2 to enter our competition for the chance to win a trip for themselves and fellow classmates to visit Embleton Hall Dairies during the Summer Term to see our production site for themselves. During the visit, the lucky winners will be able to observe our cows being milked and will receive a special guided educational tour around one of our dairy farms and local cheese-making facilities to find out how cheese is made. This is an excellent opportunity to see behind the scenes of a real-live working dairy, which the children will remember for years to come. We will provide transport and for each winning trip and take a photo of each winning class at the conclusion of their tour. Each child will receive a dairy-farming goody-bag to take home. We would like to invite your pupils to create their own milkshake recipe. Download the competition entry form (below). Colour in / decorate the sheet and fill in the recipe details. 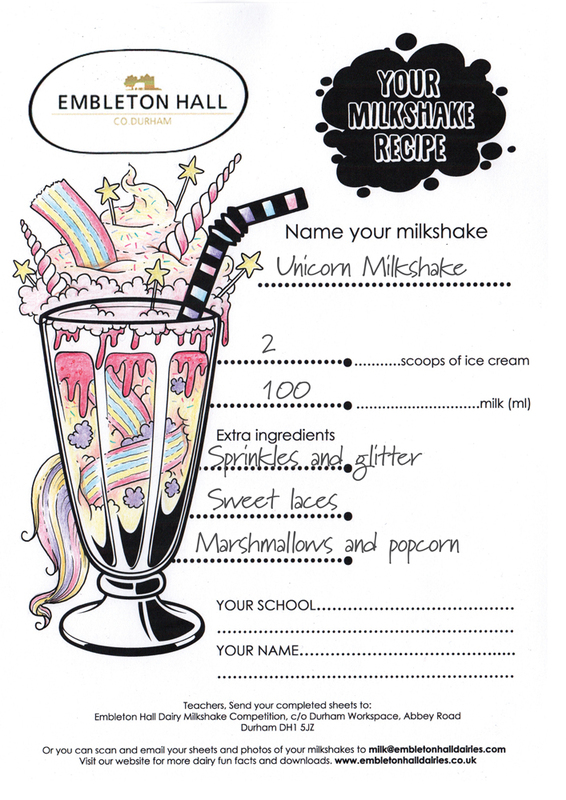 You can also send us photographs of any milkshakes that you may have made. Once your sheets have been completed, please return them to us, including any photographs to be included in the draw, email milk@embletonhalldairies.com. The deadline for receipt of all entries is Friday 26th April. We look forward to receiving your entries soon! Here are some fun ideas for your milkshake!